My last two projects each took ages. The colour gamp shawl began with dye mix experiments in December. In January I chose a draft, sampled and continued dyeing. Weaving began early February, progressed slowly and finished late that month. The end result is a great resource, looking at the colour interactions, plus I wear it as a scarf and shawl (slightly less successful since the overall flow of colour was constrained by the colour sampling rather than design aesthetics). The bellringing in supplementary warp scarf popped into my head in February. There was sampling that month, a few attempts at dyeing in March and onto the loom, then late in March I hit a speed bump which put the project on hiatus while I considered options. Finally in late April the scarf was finished, though even then I used the end of the warp for some more samples. Now, I enjoyed the process with both projects. I met my objectives, I like and use the results, I’ve had positive feedback from others, I’ve learnt. But it took a long time to realise the original spark of idea, and each time once I’d warped up and sat at the loom each pick was already determined. 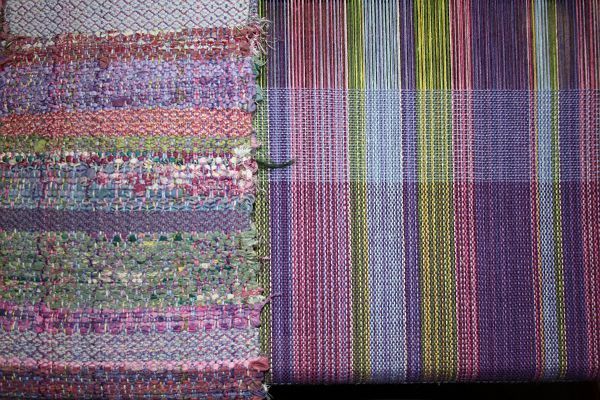 Which is fine, the act of weaving is very pleasant and I have lots of room to refine skills… just the whole process began to feel a bit ponderous and overplanned. So in my last week of holiday I decided to see if I could just weave something from conception to completion in under a week. Monday – day 1: concept and plan. I’m booked in Helen MacRitchie‘s Bag for All Seasons class for ATASDA in June. I already have the hydrangea freestyle rosepath fabric to use and want some co-ordinating fabric to give me some design choices. 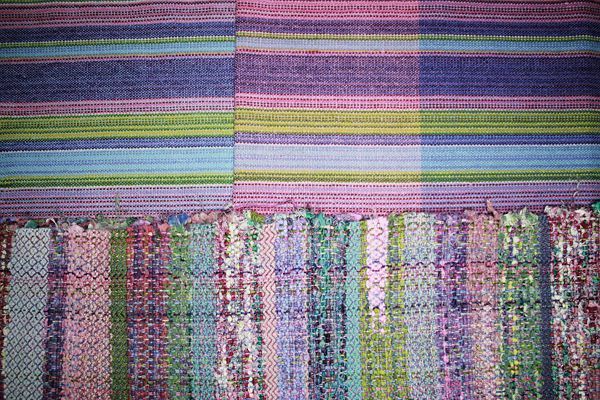 I recently got the Handwoven 2006-7 CD collection and was very taken with Kate Lange-McKibben’s project “Winter, Spring, Summer and Fall” using 4 block summer and winter on 4 shafts (May/June 2006). So the concept was some relaxed colour play, using cottolin, to co-ordinate with the hydrangea fabric. I chose colours – groups of pinks, purples, blues and greens. My old notes suggested 20 epi for cottolin summer and winter would give a good weight fabric. 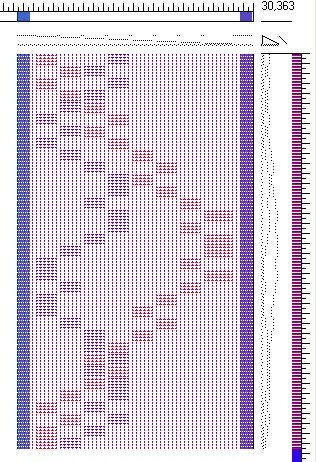 A quick sketch decided stripe layout (unit width based on fibonacci sequence) and a pencilled drawdown helped decide lift sequence and allocation of colour groups to blocks. Finally I used Fiberworks PCW, entered the stripe design in profile then used the block substitution tool to get detailed threading and liftplan in 4 block summer and winter, X style. My threading printed out (and annoted with colours due to ink outages!) I was ready to go. 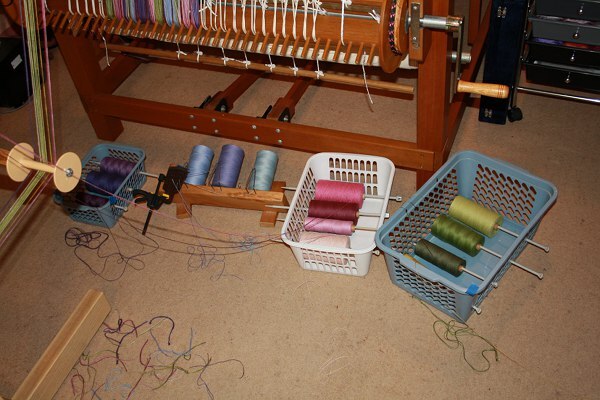 Tuesday – day 2: Warp (almost) on the loom. I tried my AVL warping wheel with multiple colour changes for the first time. Combined with my low-tech spool holders (storage baskets and knitting needles) it made warp winding faster and easier on the back. The 335 thread warp was wound, beamed, threaded and part-sleyed by the end of the day. Wednesday – day 3: Finished sleying, tied on and started weaving. Well, no. 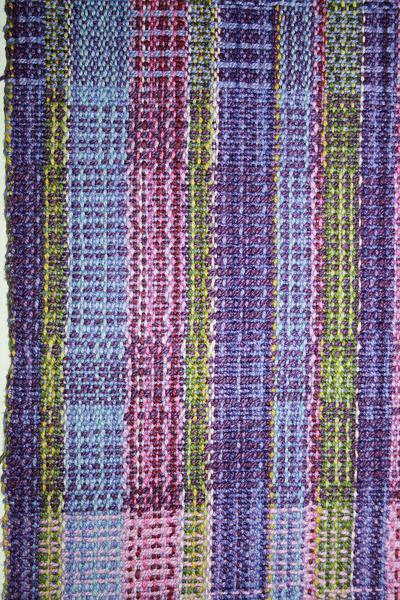 A few attempted weft colours, pattern and tabby, and I decided it just wasn’t right. Not that some of the colour interaction wasn’t interesting, and I was enjoying the weaving, but the result was too busy and I thought would fight against rather than enhance the main fabric. Perhaps plain weave… after all, with no great investment or master plan it was easy to switch tracks. 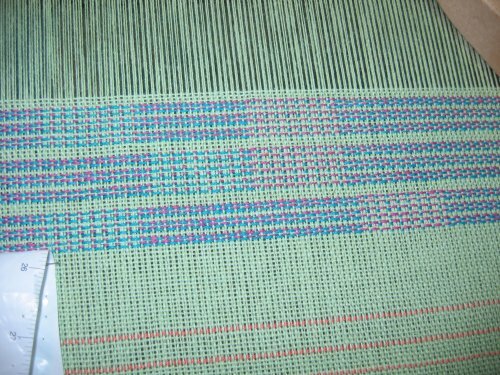 Thursday – day 4: Plain weave and a paler weft looked better. I relaxed and wove, a couple of bobbins each of a few different colours. It could be useful to have a few different colourways to mix and match in the bag – and if not, I’m sure the fabric will be handy one way or another. It was fun and I wove every last millimetre I could get from that warp. Then off the loom, a quick machine zigzag to hold the end, and into the washer and dryer with the rest of the laundry. Friday – day 5: Pressed, done and dusted. There are some skips and flaws, but given I’ll be cutting it up that’s fine. 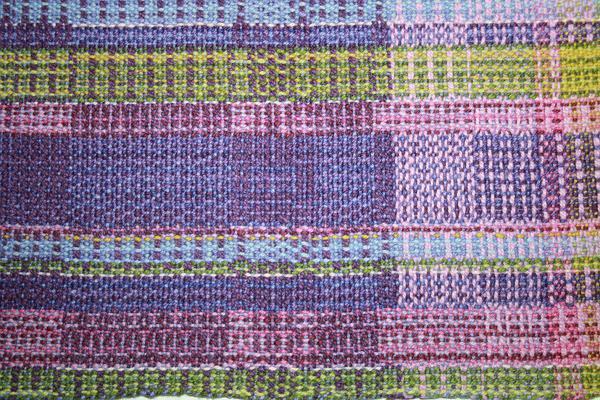 To my eyes the plain weave areas work nicely with the rosepath – interesting but subordinate. On the other hand, some of the 4 block summer and winter colour interactions are really interesting and I definitely want to revisit that at some point. 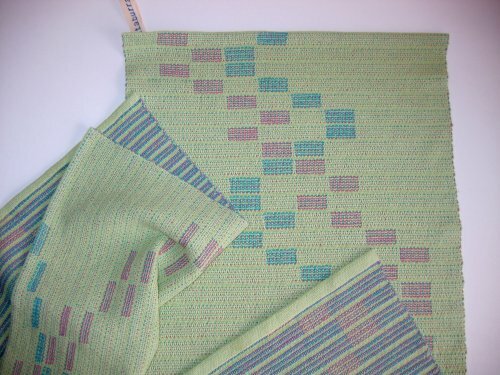 As yet unblogged, I finished these towels in summer and winter – could it be 3 months ago? Very similar to these , with some minor improvements. 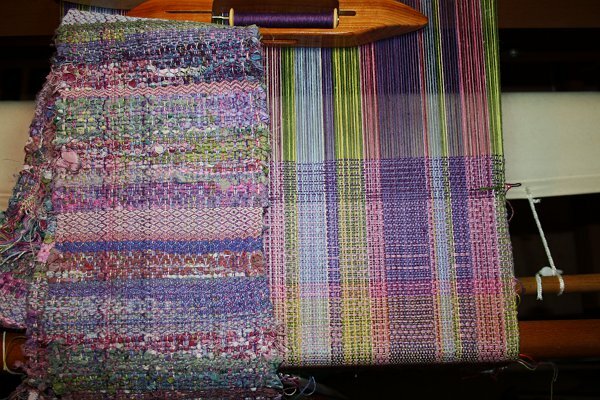 This was the longest warp I have ever put onto the loom – a whole 4 metres! The tension at the edges got a little loose by the end, easily controlled by putting in a stick at the back. I wove pretty much as far as possible. 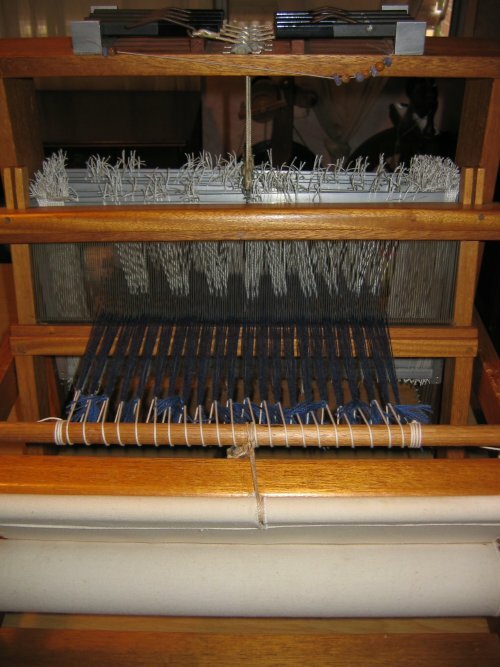 The draft uses 11 shafts, so there was enough space to get an adequate separation of the warp even with the apron bar grazing the heddles on the back shaft. My original plan was for 3 towels, but I was able to squeak out 4 – the last one I changed up the design to make it a bit shorter. The ringing methods depicted are Bristol, Yorkshire and Belfast Major (all rung on 8 bells) with the extra of Cambridge Minor (6 bells, which is what gave the shorter pattern). You may be able to see in the photo that the closest pattern doesn’t go as close to the edges, since it has two less bell positions. Also visible in the photo at the back right are the reels of cottolin sitting on my lazy kate. I love using all the equipment I’ve acquired in my textile pursuits, and the lazy kate makes it very easy to wind off bobbins. In this project, based on feedback to the blog previously, I used 8/2 cotton for the weft in the hem area (cottolin elsewhere). I didn’t use a temple in the plain weave area and also added start and end pattern sequences in white on white. 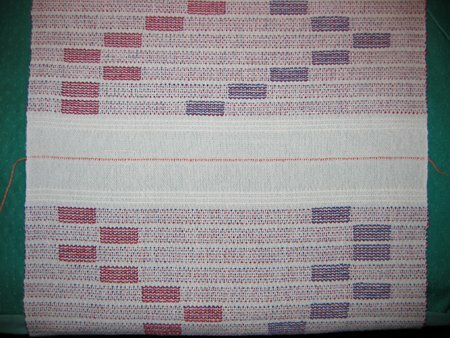 The plain weave sections between towels were much improved, with none of the widening I had in the earlier project. The hems were easy to sew, with nice crisp right angles. I also changed proportions, widening the towels. Altogether a very enjoyable project and I’m pleased with the results – especially the idea that with experience I can learn and introduce little refinements. If you’ve had enough of bellringing, stop here. If curious, you can see us ringing at St Andrew’s Cathedral on youtube here. Also, I just checked my diary – the towels were finished mid-March, just before we hosted other Sydney bellringers at a “striking competition”. In a frantic rush I finished the towels (2 are now in the St Andrews ringing chamber) and (slight textile connection) organised matching shirts for us – seen here in this classic bellringers shot. It’s that breathless moment, poised at the top of the roller-coaster. Some hard work has been done on the climb up. Exhilaration, possibly terror and some unexpected curves lie ahead. 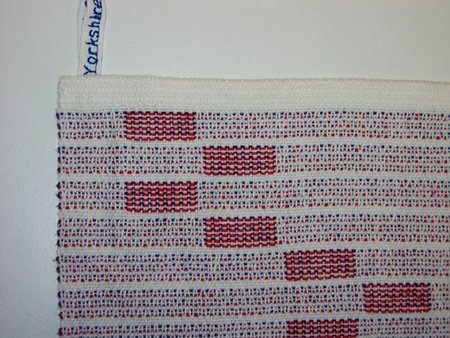 In the foreground – cottolin warped and ready to go for some more ringing tea towels, similar to this. Normally I deliberately don’t keep track of time , given it’s the process that counts and this is my recreation. There’s a good chance other ringers will ask for a towel, so just for once I decided to keep timing notes. There should be enough for 3 towels, and while everything has gone smoothly so far I’m over 8 hours before starting to weave! I’m a long, long way from doing this for anything other than the love of it… and that’s fine by me. In the background above is the 8 shaft table loom. 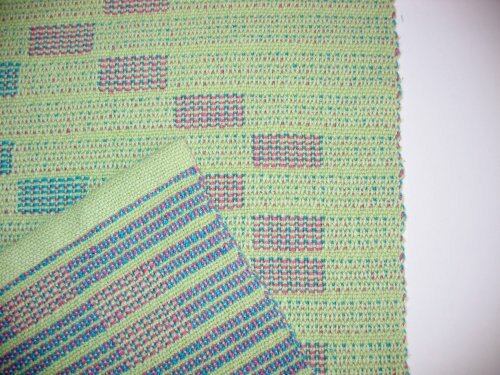 Here’s a closer look – just because I love the sense of order and the promise of a warped loom. 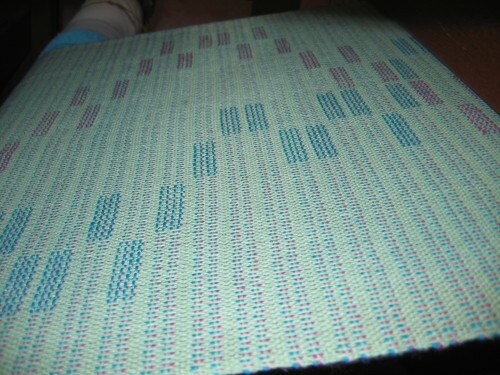 It’s ready to go too – a class work sample of collapse weave. This is Bendigo Mills classic 2 ply. 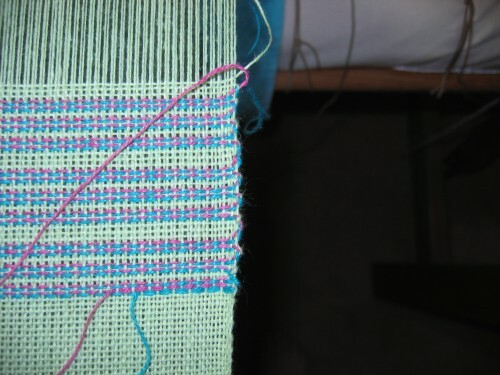 The plan is to get collapse from structure – stripes of 3/1 and 1/3 twill. I’ll use a variety of wefts, some overtwisted which should aid the collapse. It’s sett at 20epi, and I should have enough to cut off the first section, finish and review, then re-sley at a different sett (to be determined). Ta-dah! The towels I wrote about here are finally done. As Lynette commented, the colour blocks show really well – and I think to a ringer the connection would be immediately apparent. It’s taken me a while to do the finishing. Partly because I’m back at work after the summer holidays, but mostly having trouble figuring out how to finish the ends. I planned to have some plain weave at each end, but it flared out really badly. (Does anyone have a suggestion for preventing this? – the plain weave was wider than the summer and winter area). I ended picking out the machine-stitched hem, which I thought would be more durable, and hand hemming. I did use the machine to stitch the method name on the hanging tag. With experience from these “full-scale samples” I’m keen to do more with this idea. Petlins, my local weaving shop (and how lucky I am in Australia to have one!! ), reopened this week so I have stocked up on some more traditional colours for the next batch of teatowels. 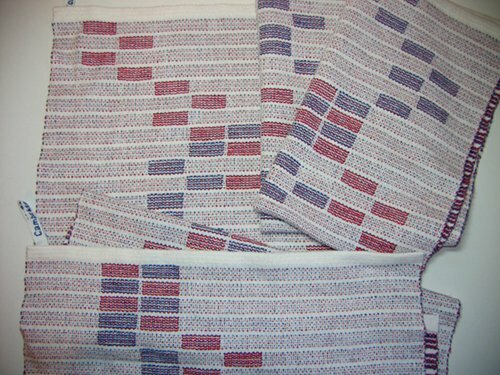 Language question – here a “teatowel” is a cloth used to dry dishes when washing up. Is that the standard meaning elsewhere? Currently on the loom – a summer and winter representation of Muttaburrasaurus Delight Major (fourth’s place bell). A deliberately obscure (but accurate) description – and a huge amount of fun. I’ve been working on the change ringing teatowels idea I mentioned in this post. An initial sample was very useful – wet finishing (machine cold wash and warm tumble dry) made a big difference to the appearance of the cloth – and left enough warp for two towels. I see the back of the pattern as I weave, which reduces the number of shafts to lift on most picks. Each horizontal stripe represents one “change” of ringing (in which each bell rings once in a predetermined order). Given the limited range of colours I have available, I’ve used pink to show where the treble (highest note) bell sounds and turquoise to follow the path of the “fourth’s place” bell. It’s easier to see the changing positions of the bells on this view of the cloth on its way to the cloth beam (just for fun I’ll be pendantic and mention that this is sixth’s place Plantagenet Surprise Major). I’m using a temple again and like it. Takes a bit of fussing, but I’m getting a better and more consistent result. The three shuttle thing is very slow, but it’s not a race and I’m finding it interesting and absorbing. I haven’t shown the sampler, since the yarns chosen (cottolin warp, pattern weft and tabby weft) are unusual and chosen specifically for this project, as is the actual threading so probably not helpful for other applications. The general comment is that the order of picks – which tabby first, how to manage the two pattern colours etc – has a big impact on the final effect. the selvedges are bumpy where I carry the colours up. Cally has been talking about selvedges here and here. Personally, I’m accepting them as an integral element of the weave. 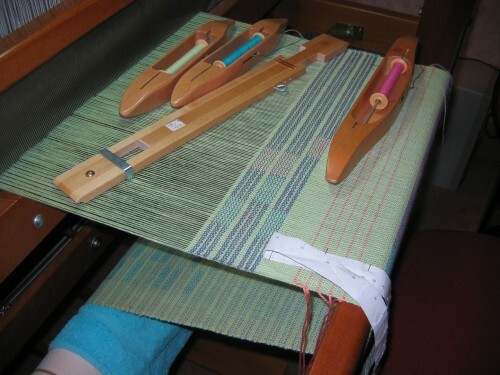 The weft bends up and down as it passes across the warp, and it bends around as it is carried up the selvedge. It’s the nature of the beast. Looking for change ringing weavers??? In a comment Trapunto wrote “And my question would be, how many bellringing weavers are there??”. Well, there’s me. There’s Anthea in the Handweavers and Spinners Guild of NSW. 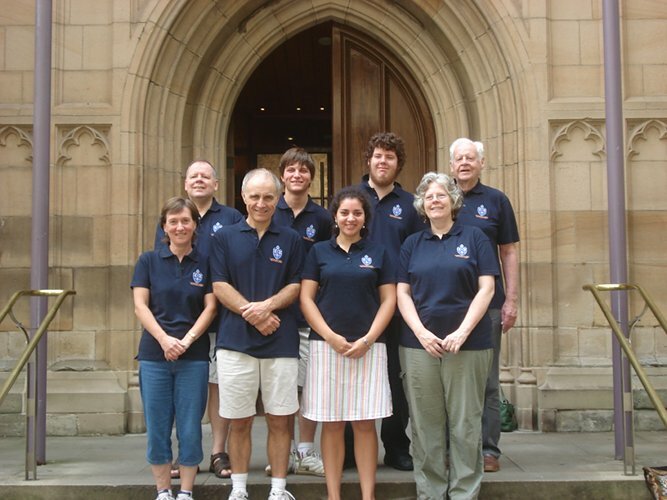 The guild meets in the church hall behind St Paul’s Burwood (a suburb of Sydney), which has bells. Anthea heard the bells one day and went up the tower to see what it was all about. There’s been an article in Handwoven which I came upon by chance – “Oranges & Lemons Say the Bells of St. Clement’s”, Pauline Drake, September/October 2000, pp. 32-34. The author used the simplest change ringing method (or pattern), plain hunt, to select stripe colours. However on checking I find she learnt about ringing from a book. 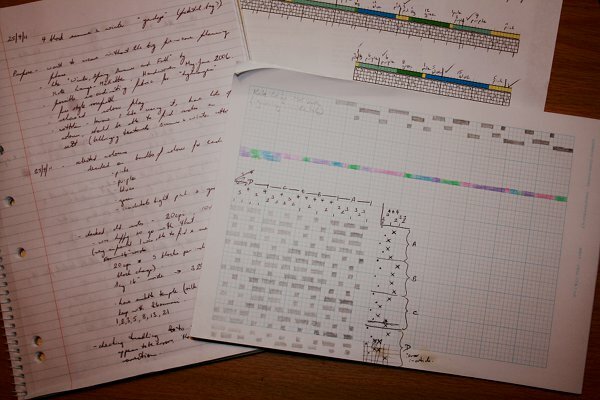 I’ve also found a project exhibited at Liverpool Cathedral UK in 2008 – an artist worked with ringers and “weaving technicians” to produce banners depicting bellringing methods. An attraction to patterns and permutations. A love of process, not instant results. A somewhat unusual interest – although something most people know a bit about (or think they do). A wealth of jargon with very specific meanings, some of which is used rather differently in “mainstream” language. A lot of underlying theory that can enrich the experience, but you don’t have to know to get along. A certain level of dexterity required and some physical demands. With both I try for an “alert rhythm” – physically repetitive motions that benefit from constant fine-tuning, plus following a pattern where your mind can drift a bit but with the risk of undesirable results. The major difference I can think of is that weaving is solitary while change bellringing is done in teams (one per bell – or one person per two bells with handbells). My overshot experiment is finished. I first described it here. I was working on my four shaft table loom, so had four blocks possible. 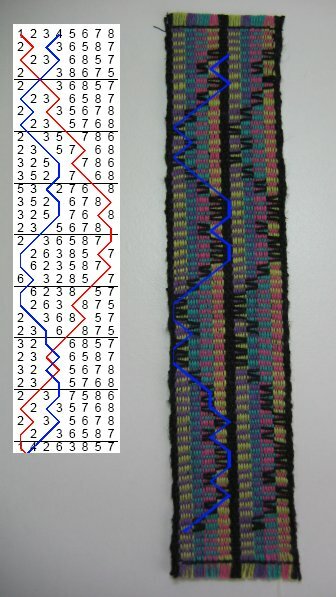 Without getting too distracted by ringing theory, on the left is the beginning of Bristol Surprise Major (diagram created in the online method database). The bells start by ringing once in turn, highest note to lowest. Then we ring again in a different order according to set patterns or methods. The path of the treble (bell with highest note) is shown in red. 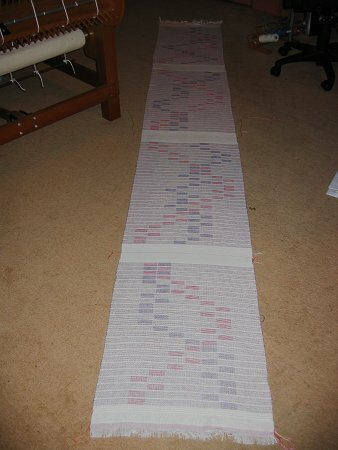 The path of the 4th bell of the eight is shown in blue – and the same path is traced in the bookmark I wove. It’s repeated because I wanted some width and also to experiment with creating a visual break with limited blocks (any pattern of the black weft is hidden by the black warp). It’s more a novelty thing – I don’t have a lot of use currently for such heavy fabric (cottolin sett at 48 epi). 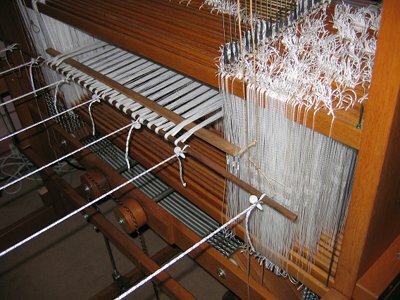 I’m now interested in the possibilities of summer and winter – especially given my big loom has 24 shafts to play with. 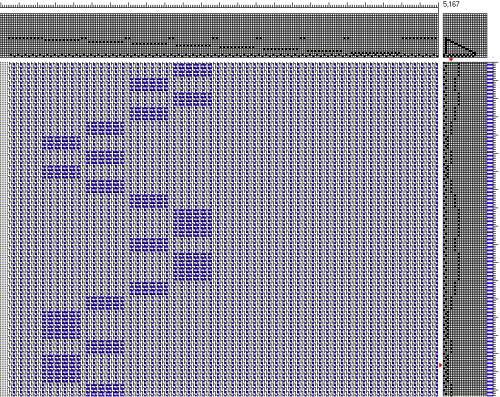 Initial experiments in my weaving software (Fiberworks PCW) gives this possibility for the beginning of the path of the 4th bell in bristol major. If I juggle with three shuttles this could be possible – the path of the treble in red as well as the 4ths place bell in blue. Maybe fun for teatowels . Step two is lots of sampling and playing in fiberworks – for a start this is the back view and I’ll probably have to flip things around to avoid getting a mirror image. 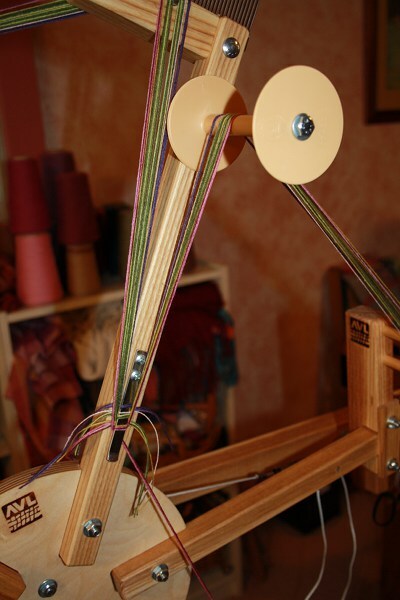 Plus all the treadling options to explore – Leigh has some wonderful posts on Summer and Winter, including this one. 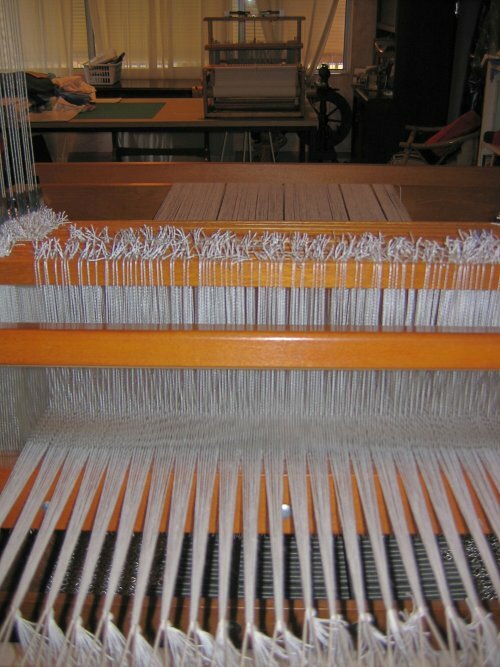 Step one is finishing the undulating twill currently on the loom – more on that another day.